Jim Steinman, the composer of Meat Loaf’s 1977 album, Bat out of Hell, had come up with the concept for a musical years before the album’s release. Over four decades later, it has finally materialised, debuting at Manchester’s Opera House before it transfers to the London Coliseum this summer. The musical tells the tale of a romantic adventure set to the backdrop of an urban disaster. It centres on Strat (Andrew Polec), the figurehead of a group of rebellious teens blessed with eternal youth, who sets the heart of mortal Raven (Christina Bennington) alight on the eve of her eighteenth birthday. Only Raven’s controlling father, Falco (Rob Fowler) stands in the way of their love, imprisoning his daughter in their luxurious tower block apartment whilst simultaneously trying to reconcile differences with his wife, Sloane (Sharon Sexton), whose role provides regular laughs at his expense. Newcomer Polec embodies the spirit of Meat Loaf whilst maintaining his own flamboyant, edgy and highly sexualised demeanour throughout. Bennington’s gentle nature and sultry vocals ignites the spark between the pair. She also controls the whirlwind of emotion her character undergoes with finesse. The performance starts with a bang, springing the audience out of their seats momentarily, before an impressive opening monologue from Strat and a compelling ensemble dance routine set to All Revved Up With No Place To Go. Jon Bausor’s excellent filmic set design falls somewhere between The Warriors and Streets of Fire, the latter of which featured two songs written by Steinman on its soundtrack. 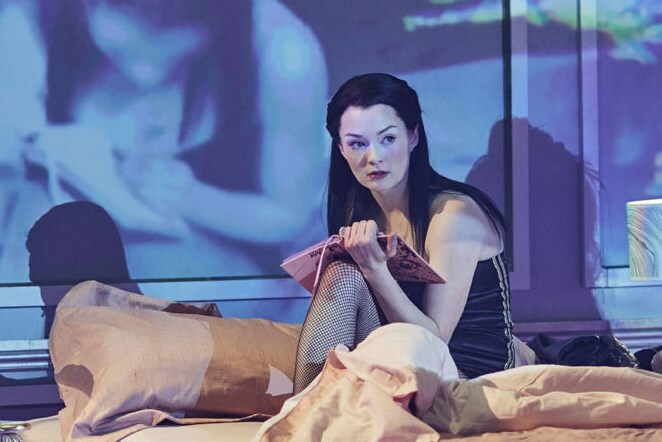 The production cleverly utilises two platform stages for set pieces between songs, with the cast filmed live and projected onto large screens, and is most effective during the scenes in Raven’s bedroom. The first half of the show peaks with Falco and Sloane’s impressive rendition of Paradise by the Dashboard Light. The set is suddenly transformed from Raven’s birthday party to a drive-thru movie theatre. The routine is tastefully risqué and retains the humour of the song, complete with its tongue-in-cheek baseball commentary as the lovers undress. Strat’s companions Zahara (Danielle Steers) and Jagwire (Dom Hartley-Harris) complete the story’s love triangle. They provide cool, stylish and powerful renditions of Two out of Three Ain’t Bad and Dead Ringer for Love to rival the protagonists’ own vocal performances. Bat out of Hell, the show’s title track, ends the first half of the show, racing at full speed before the lovebirds’ romance crashes to a halt on the freeway. The story comes away at the seams slightly during the second half, feeling hurried towards the end. This is proven after events with Tink (Aran MacRae) take a turn for the worse, which result in Raven’s fall-out and subsequent reconciliation with Strat with barely one scene in-between. However, the entertainment value of the production compensates for this, with the reunited couple’s heartfelt ballad, It’s All Coming Back to Me Now, being a strong segue into the finale. I Would Do Anything for Love (But I Won’t Do That) ties up the loose ends of the love triangle’s difficulties somewhat lazily, but makes for incredibly satisfying entertainment nevertheless. The scene features some exaggerated, comic moments – namely involving Falco – which show that the performance doesn’t take itself too seriously despite the unquestionable level of talent displayed on stage at all times. 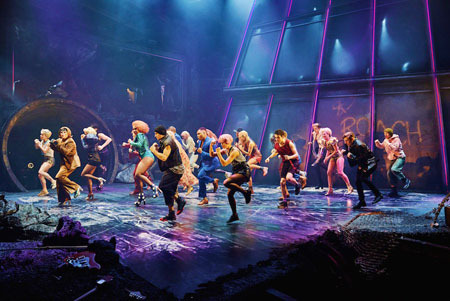 Bat Out of Hell: The Musical is a full throttle production which hurtles through the back catalogue of one of rock ‘n’ roll’s truly great artists. Its occasionally thin storyline is thickened by a stellar cast, tremendous choreography and incredible vocals which are sure to make Jim Steinman sure it was worth the wait.